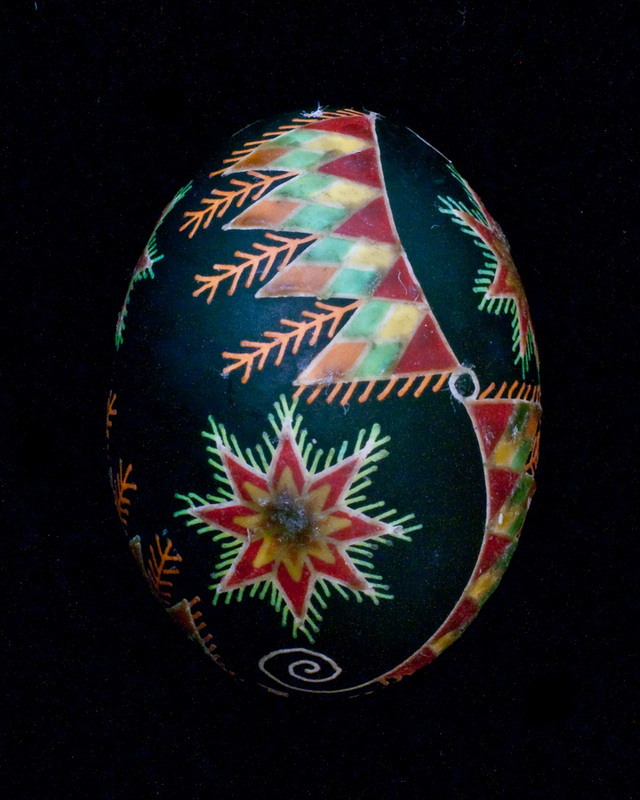 Pysanky artists seem to be few and far between here on the West Coast. This art originated in the Eastern European area of Ukraine, Poland, Russia, Lithuania etc. and immigrants brought it to this country. Like my dad’s family, most of them settled on the East Coast or across Canada and not so many came to central California where I live now. 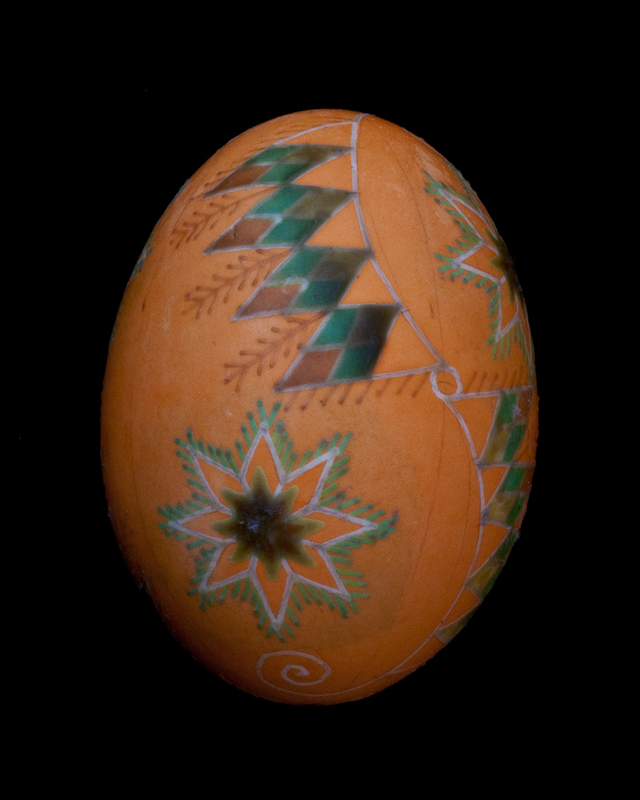 As a result it is rare for me to meet others who share my love for creating this type of egg art. Thankfully the internet has put other artists within my reach. 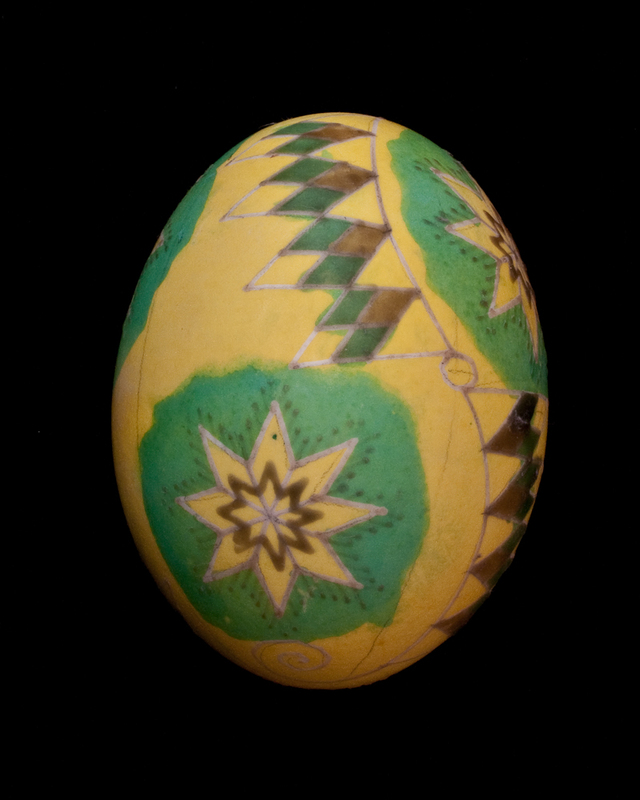 Just over a year ago I joined an online pysanky chat group and began learning new techniques and tips from our discussions. I thought I knew a lot about creating these eggs already, but found a whole new world of fun to explore. These new-found friends willingly shared knowledge and sparked a renewed excitement in me and my work. 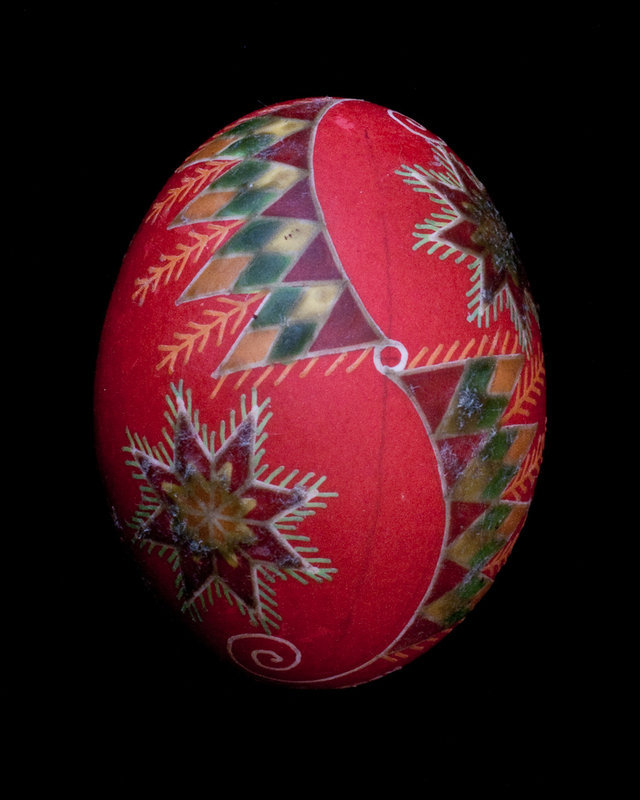 A couple of weeks ago I had the amazing opportunity to meet some of these people face to face at a pysanky retreat. Forty of us spent time hanging out together at a beautiful retreat center in Dalton, Pennsylvania. I walked into that place never having met anyone but immediately I felt like I was among “my people.” The names I knew became faces as we all spoke the same language and got excited about the same things. Together we took classes, admired each others’ work, freely shared ideas, and continued our own projects. 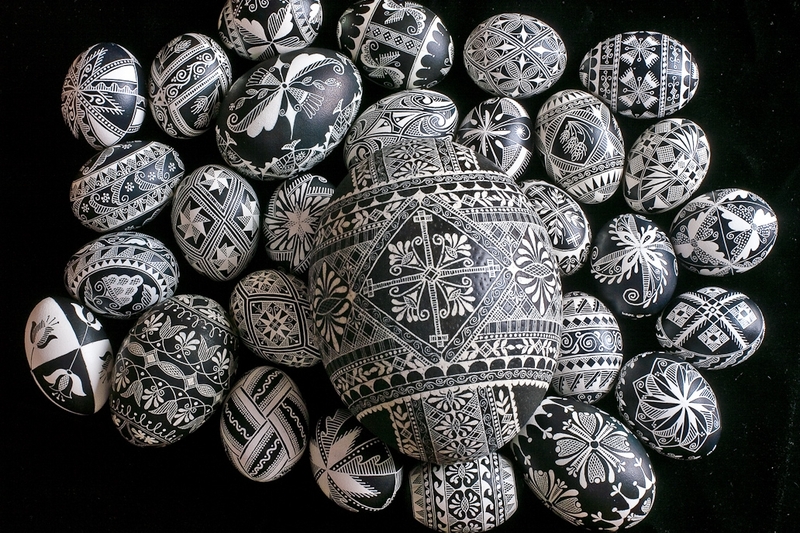 In short, I lived and breathed pysanky. I think I just got a taste of heaven. I believe God built into each of us a desire for community, both with Him and with our fellow travelers on this earth. As an artist, I find that rubbing elbows with other artists inspires my in my art and in my spiritual walk in a way nothing else does. And I don’t get to experience that very often. That’s why I so look forward to the annual conference on faith and art called Intersections, held at Oak Hills Church in Folsom, California. The visual artists were easy to spot. 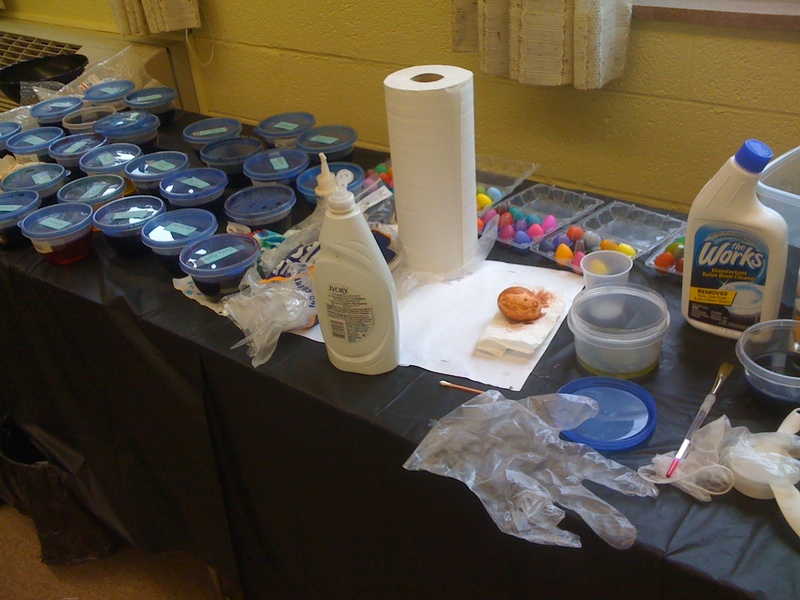 They dove right into the paints and started producing multiple pieces right away. I found watching the non-visual artists even more interesting. In some I saw the initial reluctance give way to experimentation and finally a joy at simply playing with paint. Even more fun, was watching people add their painted pieces to the growing design on the window. Intricate designs and plain colored pieces randomly combined to create beauty where before there was nothing but empty space. Great speakers, God-breathed conversations, and thought-provoking words filled our time together. The icing on the cake for me came as we wrapped up at the end of the day. With the light from outside shining in, our group “stained glass window” became a physical representation of community to me. And I needed that. I really needed that. In fact, we all do. St. John’s Art Festival opens with a reception Saturday, March 12, 2011, from 5 to 9 PM at St. John’s Lutheran Church, 1701 L Street, Sacramento. 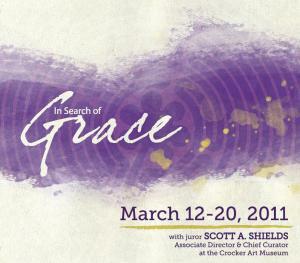 This collection of religious and spiritual works runs through Saturday, March 19. One of my pieces was accepted to this show, and submitting a piece to a juried art show is scary, there is just no way around that. Fear can keep an artist from sharing and sometimes even creating work. I know because I’m all too familiar with the self-talk that tells me my pysanky eggs are just a “little thing I do” and not really art. When I stopped to think about my art-related fears, I realized they mirror my personal fears. “Will-anyone-else-like-my-eggs” is really just me saying “will-anyone-else-like-me?” “My-art-is-no-good” becomes “I-am-no-good,” and on and on. I know to survive as an artist I must learn to separate my art from own self-worth. And to grow and thrive as a person I need to embrace this separation. The tricky part is putting this simple truth into practice. But practice takes…well, practice, so one step at a time I’m working on this personal spiritual discipline by putting my art out into the “real world” beyond my comfort zone. It’s not always easy, but it’s worth the effort. It’s taken me years to actually refer to myself an artist. And I think I’m not alone in my reluctance to claim the label. There is something mysterious and wonderful and scary about that term. If I call myself an artist, then I have to produce art, and be good at art and sell art, and make money selling art, or so we think. Truthfully the title “artist” is helpful because it describes a way people look at the world…not simply as things you can see and touch and define, but in a way that pierces the thin veil between our finite world and God-breathed eternity. And whether I call myself an artist or not doesn’t change the fact that I am an artist. Simple, huh? Well, not really. Let me take you layer by layer through my own gradual journey to claiming the title artist. Layer 1—I Can Create. As did many others, I began exploring creative avenues early in life. For most of us it starts with school projects. 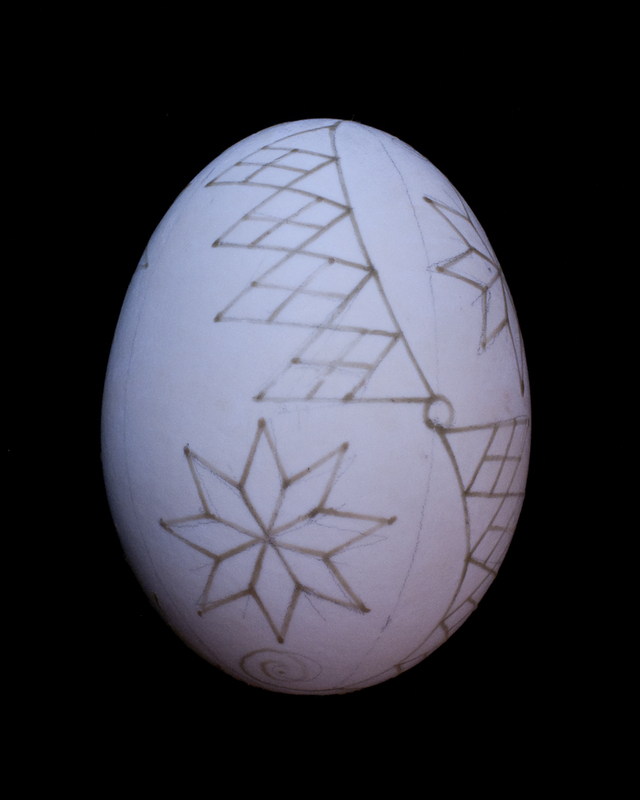 Those simple drawings led me to creative writing to playing at miniatures to quilting to cross-stitch to clothespin people and eventually to discovering the fascinating world of pysanky. And now looking back I can follow the thread of creativity through the years. Layer 2—I Can Do This Egg Thing. 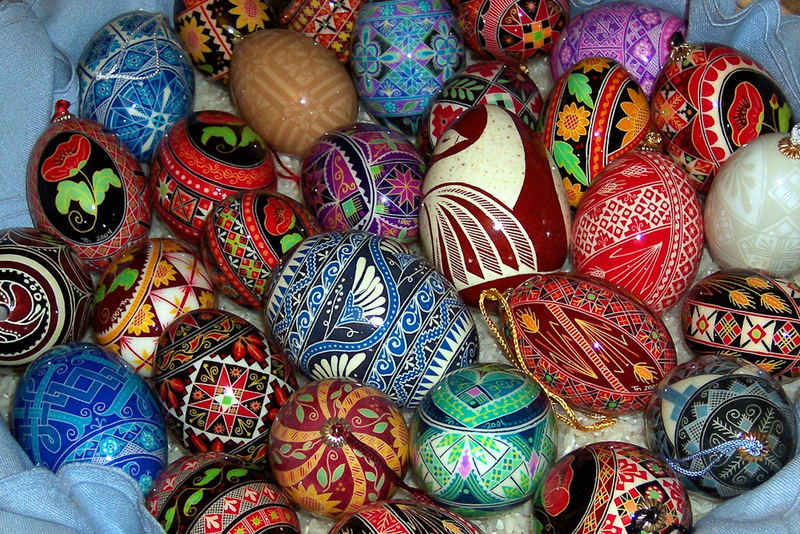 Pysanky, the layering of wax and dyes on eggshells, is a simple art yet it holds endless possibilities in terms of color and design. I taught myself the basics from a book and found I loved the challenge presented by each new egg. Even the failures provided valuable lessons as I honed my craft. Layer 3—I’m Improving. The finished egg was never the goal for me but the process of creating was. I treasured my quiet time creating, leaving the rest of the world behind. 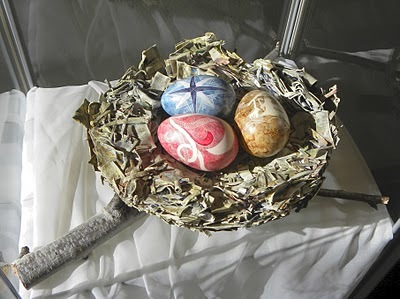 My family got to see those works but rarely did anyone else so years of finished eggs lay hidden away in a closet. Layer 4: —Am I an Artist? Eventually I began to give away some of these treasured creations to family and close friends. I was so used to seeing these eggs and thinking them commonplace, that the response they evoked surprised me. It made me realize that in sharing my work, I not only gave pleasure to others, I felt incredibly blessed as well. Gradually I let others into the private world of my art, and with much prodding from other artist friends, I “went public” with a solo show at the Art & Soul Gallery in 2006. Developing a website seemed like a reasonable next step but it took years and much hand-holding. Making the eggs is easy, marketing myself and my work is not. Layer 5—I Am an Artist…I Think. By releasing my work to the world at large, I opened myself to praise and to criticism. This is where real and imagined fears come to the surface and they can paralyze an artist. I know, I’ve been there. And sometimes I’m still there. Thoughts like these race through my head. What will they think or worse, what will they say? What if they don’t like my work, and by extension me? What if my work really isn’t good and no one told me? What if…? I have to remind myself continually that what people think of my art, doesn’t change my work or my passion for it. Layer 6—I Am an Artist…and So Are You. Having come this far, I sometimes have the privilege of seeing and encouraging other fledgling artists in their own journeys. Being an artist is mostly a solo gig. There’s no getting around the hard, often solitary work it takes to produce art. But because of that, there is great need for community among artists, for standing shoulder to shoulder, for walking together, for helping others to see themselves as God-created artists. Whether we practice our art or not, each of us is an artist and fellow traveler in life’s journey. How much sweeter is the trip when we link arms and help each other along the way. Oak Hills Church in Folsom, California, houses a lobby art space called the Art & Soul Gallery. This Advent season it featured “The Art of Christmas,” a very atypical collection of Christmas art The show was the result of local artists meeting together regularly for the past few months to encourage each other in creating art based on Scriptures related to Christ’s birth. If you missed seeing the art in person, you can still enjoy our combined efforts on the Covenant Artist’s website. Truth be told, I love stealing away to my workspace alone, leaving the rest of the world behind as I immerse myself in the work and play of wax and dyes and eggs. There is something healing and soul restoring about the quiet, repetitive actions these eggs require. I can’t seem to get enough time alone like this so when I do, I enjoy it thoroughly. Interacting with other artists is just as valuable to my soul, yet I don’t make nearly enough time for it in my life. Why is it so hard for me? I understand the value of community, I enjoy learning about the art and soul journeys of others, and I get inspired when I hear other artists speak with passion about their art. I realize I love my comfortable “alone” zone so to push against these introverted leanings, I meet monthly with other artists. In the Sacramento area, the Covenant Artists meet on the third Thursday of each month and artists of all media and skill levels are welcome. 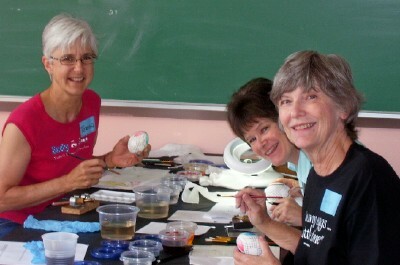 This group exists to share, discover, and learn about ourselves, our art and our God. If you would like to stretch your artistic side, I highly recommend connecting with other artists. Isn’t it time for you to step out of your comfort zone too? Lent is a time of preparation for the Easter celebration of Christ’s Resurrection. Historically the Church sets aside the forty days of Lent for fasting and prayer, imitating Christ’s forty day experience in the desert. Lent is a time of waiting. It is a season for reflection and taking stock. A time of soul-searching and repentance. Beginning with prayer and trepidation, I challenged myself to work only in black and white. 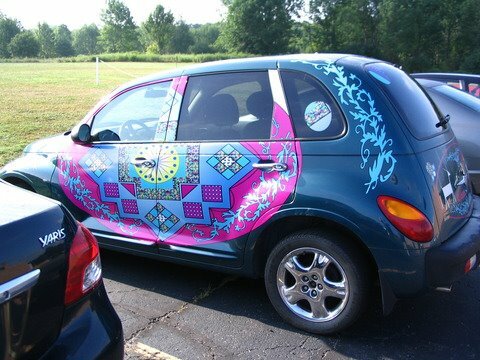 Without the distraction of color, each design must truly stand on its own. I also experimented with a wide variety of designs, from simple to complex. The time it took to create each piece provided a refreshingly quiet space to contemplate this season’s purpose. 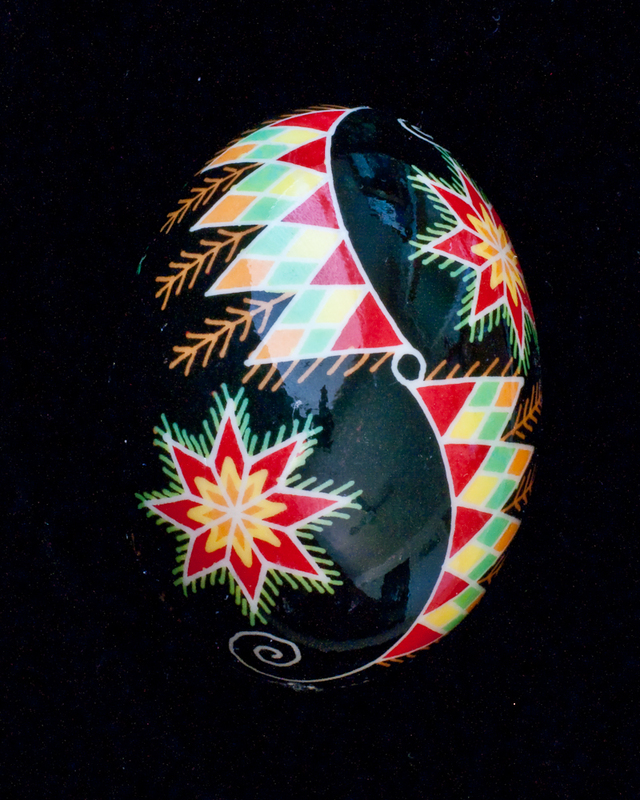 Exploring the Lenten Season through the art of pysanky has not only stretched me as an artist, it has given me a new appreciation for the history and the practice of Lent. As you wander through the gallery, take your time…slow down…and let this season sink deep into your soul as well.